Parties or special events require a fast, elegant and safe method of transportation. 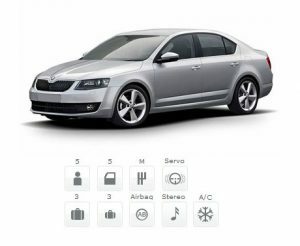 FocusRent offers you through its car rental services Skoda Octavia, for only 30 euro/day. With FocusRent, you won’t need to think about car insurances and taxes, because we offer you full CASCO and RCA included, plus a full tank of fuel and zero kilometers limit! From the first sight, Skoda Octavia impresses with its elegant design, with fine cut margins, refined surfaces, and harmonious proportions. The special attention granted for even the smallest details, the integration of the functional systems like the automated headlights washing installation or the side mirror lights, will help you easily avoid potential obstacles. Skoda Octavia’s design was conceived by combining two styles: modern and traditional, this being reflected in the elegant interior light system (lights positioned at the driver’s and the front passenger’s feet), the ergonomic and intelligently built compartments, the automated DSG transmission and the multimedia steering wheel. Other features included in our Skoda Octavia car rental services are: ABS, ASR, ESP, climatization, radio/CD player, steering wheel controls, servo direction, central locking system, electric windows, electric mirrors, fog headlights, computer board. Through our car rental services, our client will be rewarded with more benefits than any other car rental company could offer. In addition, we do not impose a limit of kilometers and we guarantee to deliver your car for free, at any hour, anywhere in Bucharest. Skoda Octavia is the best option for premium car rentals, ready to help you make a good impression, wherever you go, at a competitive price.